Wall-e had earned glowing reviews and so we thought we'd give it a go. The film was certainly very good (even if it's central messages were undercut by the fact that the shops will be full of plastic robot junk for months on end). It was sweet, without being sickly. 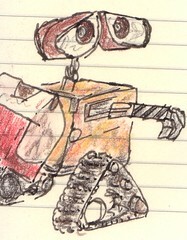 Wall-e was child-like without being annoying. He expressed a genuine curiousity about his world, and took wonder in the simple and unusual. There were only three things I didn't like. When the Axiom was slanted, all the fatties slid 'downhill'. It was a spaceship with artificial gravity... Most people, I suspect, wouldn't even notice that. What a shame. Rather than angling the ship, exactly the same sequence could have been done by having a malfunction in the artificial gravity. The amazing muscular regeneration which allows someone to stand (albeit with difficulty) after a lifetime in a chair, and shortly thereafter allowing everyone to join him (without one person saying 'No, I like my chair'). This latter point was a neccesary evil for the story though. I wasn't crazy about the sheer amount of space-junk in orbit (but then, a more realistic amount would not be seen on film). Similarly, the sheer volume of rubbish being cleaned was over the top in terms of the raw material availability - but then, one could suppose that Wall-e would be working somewhere in Manhattan, and that there'd be whole stretches of the planet which were desolate but clear. Little touches I did like were the PC/Mac thing that Wall-e and Eve had going on. Wall-e even used the windows startup sound. I wonder if that little cleaner robot was called fsutil? I liked the 2001 references with Otto. I liked the general grubbiness of the world, with the huge skyscrapers showing how long wall-e (and his now defunct kin) had been working. I liked how well wall-e could 'act', when all the guy could really do was zoom in and out, open and close his apertures, angle his cameras, and extend his neck... actually, there are lots of degrees of freedom there. Hackzine found this Origami Wall-e with video from MIT Tech TV. LivingInTension says it 's Better than Batman. Bookface found the film a disappointment, and points out some of the built in contradictions. Terminal Days pronounces is 'fairly good'. John Gordon speculates about where the Axiom was launched from (as it was melanin deficient). Rubbersquare says it was better than Cars, but this didn't take much. Beth liked it, claiming it to be the modern day 'Lorax' (by Doctor Seuss). KayRay seemed to like it, and comments on the lack of annoying wise-cracking animals. Lewis C praisies the plot, and talks about the reactions of the small boy. Jennifer talks of her Wall-e experience (without spoilers). She liked it.